There are a few references in Egyptian texts to Shasu nomads living in the area of Nubia south of Egypt. Merneptah Stele mentioned “Shasu”, a term used by the Egyptians to refer to nomads and marauders. I guess it refers to Israelite in the Sudan or Libya. If it was referring to those in Canaan it should had been “Habiru or Apiru”. 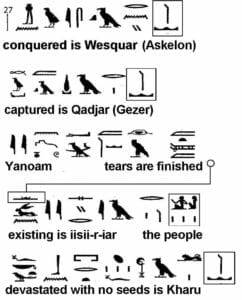 Two New Kingdom inscriptions which refer to “the Land of the Shasu of Yahweh” are found in topographical lists. One list is at Soleb and the second at Amarah-West. Soleb, a temple dedicated to the god Amon-Re, was built by the Pharaoh Amenhotep III in ca. 1400 BC. Today it is located in the nation of Sudan, on the left bank of the Nile about 135 miles south of Wadi-Halfa. The Soleb stele dates to 1400 BC which was found in Sudan mention “Shasu of Yahweh”. Watch this video, particularly form 1.00 min. The remnants of Israelite after the Exodus didn’t stop roaming, looting, enslaving, and invading for very long time in North, West, Central, and East Africa. They had brought Kerma civilization to an end during Classical Kerma (ancient Nubia) (c. 1750–1580 BCE) and colluded with the Hyksos against Egypt. This was the same period which witnessed the Slavization of Eastern Europe, the fall of Hittite, and the great collapse of 1177 BC, and the appearance of the Sea People, all these were results of Turkic nomads who later took over Iran and created Persia. I assume the Egyptians recognized that the Israelite and the Hebrew although were from different directions but of the same Yemeni Arab origin. The Israelite were active in Africa while the Hebrew in Canaan. The Turkic Mongolians were looting Western Asia, Eastern Europe, Caucasus, and Anatolia. The Israelite in Africa got more strength after the Turkic Persian Jews expelled most of the Hebrews of the Ten Tribes of Israel and the Canaanites after 530 BC. Some of the expelled were brought to North Africa and joined the Israelite slavery bands. They were joined by more Turkic groups after 650 AD. Interesting but why “created 10 tribes”? One wonders which of these 3 (or more, with the later conversion of the Khazars in the Christian era) groups is “God’s Chosen people”? None of these, the Chosen must had had followed Jesus, and if they did they were supposed to stand against the churches. Egyptian king Merneptah (reign: 1213 to 1203 BC) left a very important stele. The text is largely an account of Merneptah’s victory over the Libyans and their allies, but the last 3 of the 28 lines deal with Israel. The more reasonable explanation is that the stele is referring to Israelites in Libya and/or Sudan; but not Israel in Canaan. Accurate translation and understanding of Merneptah Stele could reveal new interpretation of the history of Israelites in Africa. Do these words make sense now? Perhaps holding proper beliefs and how one lives one’s life is more important than who one’s parents were. This whole idea of a Chosen People has been twisted. If people were “chosen” it was for a task, for a purpose – not because God was showing favoritism. Yes indeed Sudan, Eritrea, Yemen, and Ethiopia shall open new frontiers for history discovery. Akhenaten probably admired the faith of Abraham, but definitely he realized that the Israelite are terrible pagans. Monotheism is not only in Sudan but also in Abyssinia. Certainly ancient Africans valued Abraham and were perplexed why his own descendants are such savages.